I'm sure you have noticed that dip dye seems to have been popping up everywhere over the past year, making its way into fashion, interiors and even hair. Iv'e been searching the internet for some really inspiring and "out of the box" ideas with dip dye to share with you. 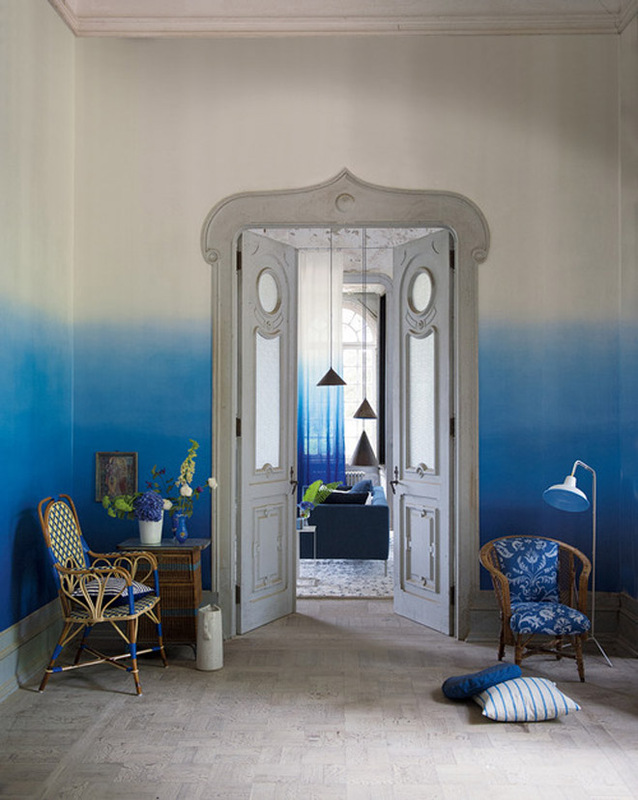 Love the new range from Designers Guild who have have taken aboard a dip dyed look to the walls in their Autumn 2012 promotion. 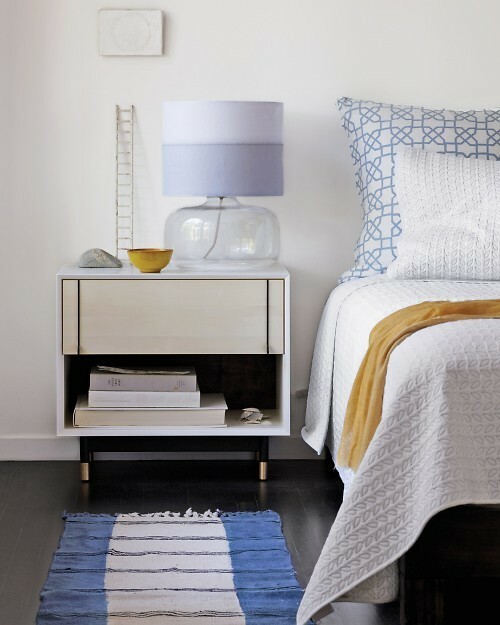 Fed up with that plain duvet cover, dip dye if white or if coloured then dip in bleach to remove colour. 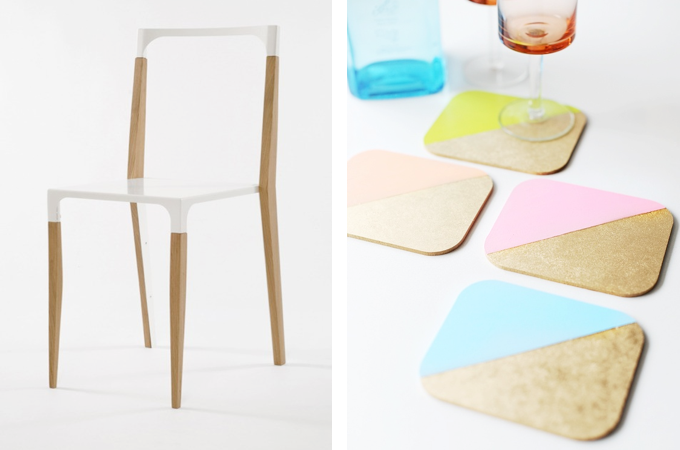 The ideas below are via, Papernstitch, a fabulous blog with lots of inspiration, diy, crafts and more. Hop over to read Brittni's post "Dipped and Dyed". 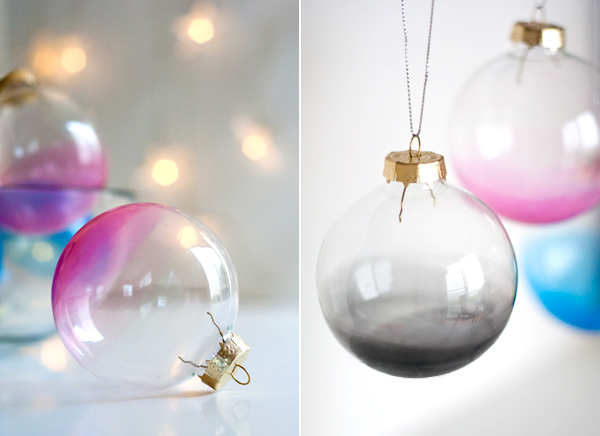 DIY ombre ornaments via Ambrosia Girl another great DIY/craft blog. Pop over to see step by step instructions on how to create these dip dyed ornaments. They would look great hanging or displayed together in a bowl. 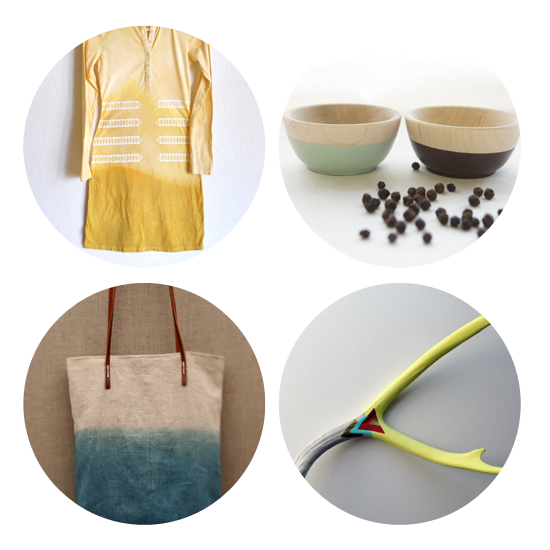 For lots more dip dye inspiration, crafts, interiors, fashion and more, visit my "Dip Dye"Pinterest board. If you decide to diy and dye, please send me your results, I would love to share them with my readers. Thanks for dropping by Vic. Designers Guild fabrics are absolutely divine and I'm sure you can find a spot for one of their cushions. With regards to dip dye, I have a crocheted bedspread that was stored away at my mums. I washed it but it has a slight discoloration along the top, so thought, hmmm, maybe I can dip dye the top of it(where the discolour is) in pink and it would then be perfect for a little girls room. Sounds fabulous, I love turquoise and have accents of this colour in my bedroom. 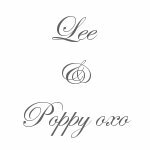 Glad your enjoying the blog, please come back and visit again, posts are regularly updated or you can sign up for email and have them delivered to directly. My friend has this chalk type stuff that she can use to dip dye her hair for a couple of days - it looks amazing! Would love to know what it is Caroline if you can find out, then maybe I will be brave enough to do a piece of my hair. Great inspiration photos! I have a dip dye project that I have been dying to tackle. Would love to see your project when its finished Angela. Great photos! I think the dip dyed hair would be fabulous if I was younger and not such a traditionalist! If I weren't I may give it a whirl myself. It is quite interesting. I tend to agree with you Anne-Marie. Most artists are rather outgoing in their appearance but I have always been one to blend in with the crowd so to speak. If I could live my life again I might be a more colorful person and definitely go for some daring colour. I think the look above is gorgeous. I would soooo have pink in my hair if i were younger, in fact i might even do a strip now at 59 years old, why the heck not! 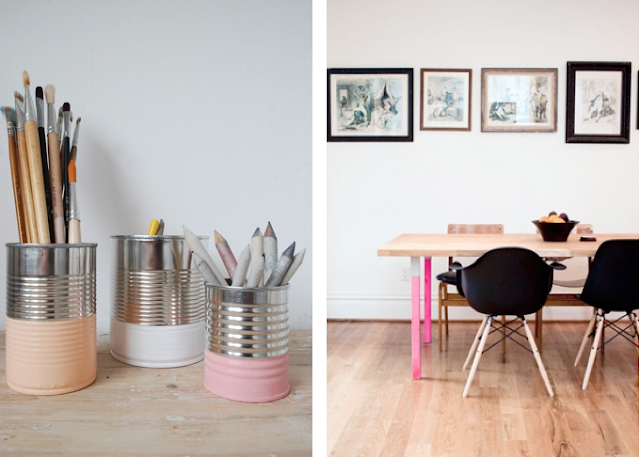 Love those dip dyed cans! Hi Cindy, thanks for dropping bye :). I think you would look great with a stripe of pink and no way do you look 59!. I thought I would do some dip dye cans to keep my artists brushes in rather than the glass jam jars they are currently standing in. I guess I could also dip the jars actually.